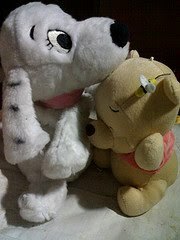 These are my bed buddies before...Penny and HuggyBear... Now they were given to my nieces... Look how close they are... They are my choice for this week's Mellow Yellow Monday. Oh that is so sweet! that's so cute and so sweet sis!